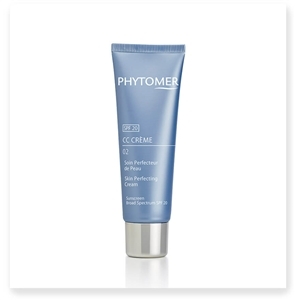 Phytomer's light and fresh CC CRÈME naturally enhances the skin because it is 1/ Moisturizing, 2/ Pore refining, 3/ Radiance enhancing, 4/ Unifying, and 5/ Protective, all at the same time. This Skin Perfecting Cream is the perfect formula for flawless skin. CC CRÈME goes a lot further than makeup; it acts at the heart of the skin to beautify it. On a daily basis, regardless of the season, our skin is abused: aging accelerates and wrinkles appear. With ALGODÉFENSE, Phytomer provides a complete action to fight pollution, free radicals and UV rays. The skin is immediately protected. Day after day, the complexion recovers its radiance and the skin is smoothed. This delicately scented cream with UVA/UVB sun filters offers effective protection against damage caused by the sun and protects the skin's youthfulness. Its innovative, ultra-light and non-sticky texture leaves the skin incredibly soft and supple. This delicately scented cream with UVA/UVB sun filters offers effective protection against damage caused by the sun and protects the skin's youthfulness. Its innovative, ultra-light and non-sticky texture leaves the skin incredibly soft and supple. SUN RADIANCE delivers a uniform, long-lasting tan. Its light, white texture is easy to apply without leaving streaks. Its luminous, satin finish leaves your skin feeling like summer! Phytomer's cool, soothing. After Sun-Milk restructures and calms the face and body after sun exposure. 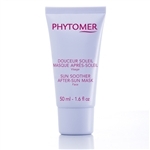 Phytomer's After-Sun Mask protects against the sun's harmful rays, and helps keep your skin younger looking by fighting free radical formation. 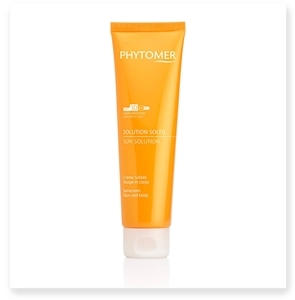 PHYTOMER presents its new 2 in 1 after-sun solution: renews and prolongs your a tan for a more glowing and better preserved effect.